ONE OF FOUR RECORDED EXAMPLES OF THE 1867 ONE-CENT ALL-OVER GRILL ESSAY, WHICH IS UNLISTED IN SCOTT. 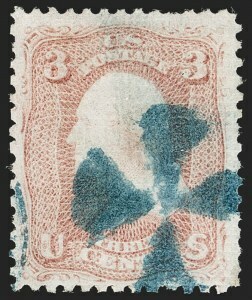 THIS IS THE TOP LEFT STAMP FROM THE UNIQUE STEEL, EARL OF CRAWFORD AND WORTHINGTON BLOCK OF FOUR. The four recorded examples of the 1c A Grill essay come from the block of four illustrated here, which originated in the Charles F. Steel archive and was part of the Earl of Crawford and George Worthington collections. This is the top left stamp. 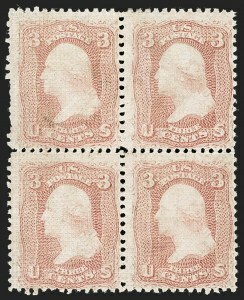 The bottom left and top right stamps are from the "Lake Shore" (Siegel Sale 890, lot 261) and C.W. 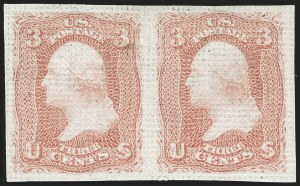 Christian collections, respectively (Siegel Sale 1053, lot 135). We do not know the whereabouts of the bottom right stamp. The grill has tiny "X" pyramidal points impressed into the back, which differs from the essay grill made of small squares (79-E15a/b); it is very similar to the issued A Grill. The 1c block and a 5c block with the identical grill were acquired by the Earl of Crawford from the archive of papers and stamps retained by Charles F. Steel, who patented the grilling device. For more information about the origins of the experimental A and C grills, please refer to Chronicle 134 and to our Siegel Encyclopedia at http://siegelauctions.com/enc/pdf/1867.pdf . 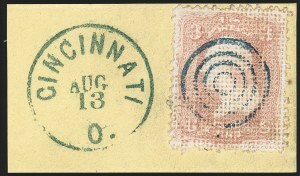 Two of the stamps from Steel's 5c block were previously certified by The Philatelic Foundation as Scott 80, which indicates how similar this grill is to the issued A Grill (Scott 79, 80 and 81) -- they are now classified as essays. We believe that the 1c and 5c A Grills from the Steel blocks deserve Scott Catalogue listings -- we would go so far as to put them at the front of the catalogue as "not regularly issued" grilled stamps. Whether or not Scott's editors concur with our view, collectors should consider the stamp offered here to be an integral part of classic U.S. philately. FINE APPEARANCE. 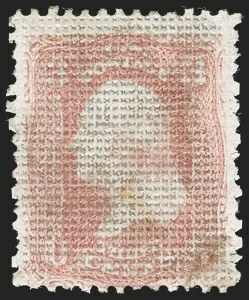 AN EXTREMELY RARE BLOCK OF THE EARLIEST GRILLED ISSUE, SENT TO POST OFFICES IN AUGUST 1867. VERY FEW BLOCKS ARE KNOWN. The August 1867 3c experimental A Grill was the first grilled issue. It was soon learned that the all-over grill weakened the paper and interfered with perforating and separating, resulting in rough perforations and pieces torn out of the margins when split apart. Within two months of A Grill production the apparatus was modified by dividing the embossed area into small rectangular units within each stamp (C Grill). Multiples of Scott 79 are extremely rare. The largest multiple is a block of six with no gum. The last block we offered in one of our auctions was in our 1998 Zoellner sale, and that block also did not have gum. Ex Sinkler. With 1992 P.F. certificate. This was offered in our 1966 and 1991 Rarities sales. Scott Catalogue notes "Values for No. 79 are for Fine-Very Fine examples with minor perf faults"
FINE. A RARE AND UNUSUAL EXAMPLE OF THE 3-CENT ALL-OVER GRILLED ISSUE, WITH THE GRILL SHOWING POINTS DOWN AND WITH HORIZONTAL GRILL RIDGES. The August 1867 3c experimental A Grill was the first grilled issue. It was soon learned that the all-over grill weakened the paper and interfered with perforating and separating, resulting in rough perforations and pieces torn out of the margins when split apart. Within two months of A Grill production the apparatus was modified by dividing the embossed area into small rectangular units within each stamp (C Grill). The grill on this stamp was made from a male device with prominent horizontal ridges (in upright orientation to the stamp). The closest regular-production grill is the Z Grill, but its dimensions are smaller. Mr. Drews records only two examples of this variety. FINE APPEARANCE. ONE OF FOUR RECORDED EXAMPLES OF THE 1867 5-CENT WITH THE EXPERIMENTAL ALL-OVER "A" GRILL. 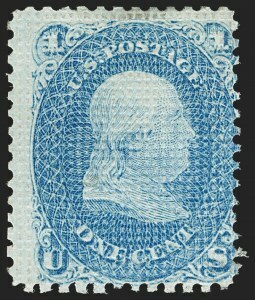 THIS IS ONE OF THE KEYS TO A COMPLETE COLLECTION OF UNITED STATES STAMPS. Our census contains four 5c A Grill stamps considered to be issued stamps. All four are cancelled. Two are in shades of Brown, which are classified as Scott 80 (although one has a P.F. certificate as Scott 80a), and two are in the true Dark Brown shade, Scott 80a. The unused copies now classified as essays are from the same block of four. For a complete census of the 5c A Grill, please go to https://siegelauctions.com/census/us/scott/80 . 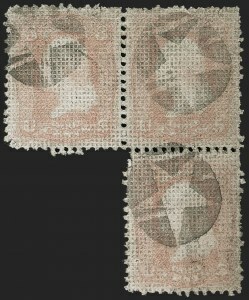 Two of the recorded examples, in the Dark Brown shade seen on covers dated from October 1867 to May 1868, originally formed a pair and were used as singles on the same cover. The example offered here is in a slightly lighter shade and must come from a different supply of 5c sheets printed earlier. 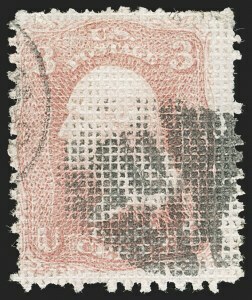 The stamp offered here shows some of the effects of the all-over grill on the perforations, which were weakened and easily torn during separation. For this reason, the experimental A Grill device was retooled to reduce the dimensions of the grill, producing the C Grill, and all later grills were made smaller to improve the grilling process and its product. 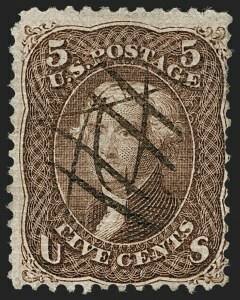 The two examples of the distinctive Dark Brown, Scott 80a, show perforation defects, but the two others do not. Obviously, the presence of perforation flaws should be considered a perfectly normal character trait of this issue.